Combine this property with Hidden Beach Oasis Modern Beach Home to sleep up to an additional 12 creating a 7 bedroom 4 bath compound / estate with up to 4 off street parking. Sunset Breeze Retreat is the perfect Sunset Cliffs vacation rental! This 2 bedroom 1 bath updated vintage beach house has views of the ocean from the kitchen and front yard. Sun filled living room and dining area seats up to 12 with a separate eating nook that seats 3. Encased by a wall of tropical bamboo you can gather with family in the backyard for a meal and utilize 1 of 10 outdoor seating spaces while kids enjoy the fully enclosed gated grass area. The master bedroom has a garden like setting and a Queen bed, large closet, desk area, and a flat screen TV. The 2nd bedroom sleeps up to 3 with a Queen bed and single pull out trundle. Fold out couch in the living room extra sleeping space for 1 or 2 . Updated with a contemporary stainless steel kitchen. Cozy up to the comfortable gas fire place in the living roo. Enjoy this spacious 2 bedroom Sunset Cliffs vacation rental which is very well cared for and clean! It even features off-street parking for up to three cars! Only 7-10 minutes to Sea World! Meal time? The updated Stainless Steel kitchen with an open floor plan allows you to cook while entertaining so you are not separated from others. Large loads of laundry? There is an oversize washer and dryer available for use to keep your clothes fresh and ready for the day. Lazy day? Enjoy Netflix, Pandora and other WiFi enabled programs on 3 flat screen TVs' with Smart-Hub technology. Kids on vacation can sometimes feel bored? Not here! Explore the cliffs, beach area and when at home, avoid the tv with a plethora of board games, books and Lego. If heading the the beach, enjoy 2 boogie boards for some fun in the sun and 4 beach chairs , cooler and an umbrella for relaxation in the sun. Beach towels and sand toys provided as well. With Ocean Beach also just around the corner you can enjoy several restaurants and bars in a trending area of San Diego known for it's food, bohemian styling and some of the best surf. Wednesday Farmer's Market, clothing shops at every turn, surf stores, organic food shopping, antique stores, sushi/tapas and for us winos some wonderful vino spots like "The 3rd Corner." Also, don't miss out on going just over the hill! Point Loma north offers several marinas and fish eateries along with Kellogg's Beach right along the bay and great for small kids or a nice run. Live music at Humphrey's or a movie night at a hotel pool at "The Pearl." Just over the hill you can enjoy these views of Sailboats and Coronado Island every day. 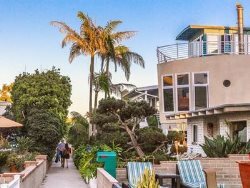 This Sunset Cliffs vacation rental is a place that is truly a "Home Sweet Home" with bright interior and sure to give you and your family lasting memories for the rest of your lives. This home will be on your list for each time you travel to sunny San Diego. PLEASE NOTE: Our rental agreement includes a no tolerance policy regarding noise disturbances, over occupancy and/or parties. Outdoor Quiet time begins at 9 PM. Deposit forfeitures, fines and evictions for violations are strictly enforced. Please make sure you are comfortable with these policies and closely read the contract terms and conditions before renting with Wanderlust. We opted for this place over the downtown loft because we wanted space for the kids. That was definitely a win for us, perfect for families. It is a bit far (still do-able) to walk to nightlife, but then it's quiet and vagrant-free at night as a result. Ocean Beach has a great coastal vibe, lots of inexpensive scooter rentals, even it the neighborhood...good for fun and short commutes, and just a 15 minute drive to Balboa Park, Little Italy, Gaslamp and Waterfront districts. Lisa was excellent to work with! She had many good suggestions of places to shop and eat. 5 Star: Cozy, Eclectic Cottage in South OB/Sunset Cliffs This home was a real find! It was so comfortable and clean! It had a great use of space and the storage was great. The furnishings and art were perfect for the space... very eclectic and fun. The overall aesthetic was cozy and warm, very 20's bungalow with modern amenities. The neighborhood was quiet and just a few blocks away from the bustle of OB/Newport Avenue. You have room to have your own space as well, so our family of four was easily accommodated which made the space feel more like our home for the week.. it had everything you need for a great stay in OB ! 5 Stars: Lisa, the owner, proved herself to be helpful even when she didn't have to be. Her character really shines through in the house. A true gem this place is! Thanks so much Lisa! 5 Stars: Lovely house by the beach, ideal for small group My family and I had a lovely stay. I'm already trying to arrange for another visit. This holiday home is exactly what it appears to be in the profile. It was clean, stocked with necessities, comfortable, and all around lovely. My sister and I walked to the beach every day. There was no point in driving. In fact, we walked daily to our favorite coffee shop, and caught a mouth watering bite of authentic Mexican just next door. The neighborhoods are beautiful, and the neighbors are extremely friendly. Please note: No smoking is allowed. This home is located in a quiet neighborhood and is only suitable for quieter groups. Our rental agreement includes a no tolerance policy regarding excessive noise, occupancy and/or parties. Deposit forfeitures and/or evictions are strictly enforced. Please make sure you are comfortable with these policies before renting with Wanderlust. Please note: All occupants must be approved by management and /or property owner and reservations may be declined solely at management discretion. All rates are subject to change until confirmation of booking. Deposit forfeitures, fines and evictions for excessive noise, parties, over occupancy and other contract violations are strictly enforced. Please make sure you are comfortable with these policies and closely read the contract terms and conditions before renting. Furnishings and amenities are subject to change.